This set of table lamps by Stephen Downes, alabaster expert and student of Master Stone Carver René Lavaggi, are made of polished alabaster, patinated steel, and textured limestone and emit a soft light through their thick alabaster shades. 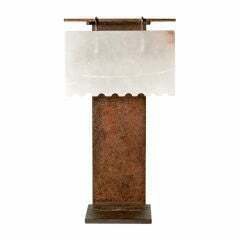 Small - Height: 11.75" Width: 10.5" Depth: 4.5" Medium - Height: 13.75" Width: 12.5" Depth: 4.5" Large - Height: 19" Width: 13.5" Depth: 4.5"
"Shiloh" Patinated steel table lamp with a polished alabaster shade by Stephen Downes. The Copiaco lamp, carved of two pieces of black walnut that have been sanded so as to be smooth to the touch, is topped with a cylindrical alabaster shade. - 1960s - maker: Kamenický Šenov - brass with patina - labeled. Table lamps made by Philips, enameled black steel base with large silver colored light bulb. White frosted glass Perfect working order Perfect condition Measures: H 41 / 26 cm. Set of three lamps in crystal by Daum France. Three dimensions, free form. Signed Daum, circa 1960. Rare set of three table lamps model d902 "scafandro" by Sergio Asti for Candle. Milky glass shade with black rubber base, three different sizes. Measures refer to the tallest piece.